The High Divide Region – the chain of Idaho and Montana counties that link Greater Yellowstone to the wildlands of Central Idaho – has been identified as one of the most important ecological corridors in the country. The long term well-being of many wildlife species most often associated with national parks like Yellowstone and Glacier, will depend on the conservation, and where necessary, restoration of these High Divide habitats. A hallmark of the High Divide is also the working landscapes – farms and ranches – and rural communities whose economies are intrinsically linked to the well-being of the natural environment. In few other places is there such a direct and obvious tie between people and the lands and waters that make up this region. The High Divide is home to a diversity of local conservation organizations. Many embrace a collaborative, community-based approach to their work and their efforts have resulted in significant conservation gains. 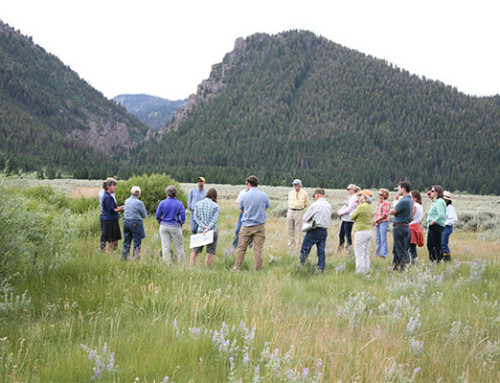 Local leadership is critical to successful conservation and community-based organizations are uniquely positioned to achieve the goal of conserving and restoring the High Divide region. Unfortunately, many of these groups often have limited budgets and staff and are operating ‘on a shoe string’ in contrast to their traditional environmental group peers. Tailored organizational development and ‘back office’ training. Solidification of a communication network to enhance peer-to-peer learning, share best practices, and provide a venue for collective action. Direct investment (small grants) in their operations so that they have the financial stability to seek out additional investment.